If you or your spouse is 50 or older, and you like to travel, you should definitely join the American Association of Retired Persons (AARP) to get discounts on tours, hotels, restaurants, car rentals, rail travel, phone service, insurance and many other travel services. 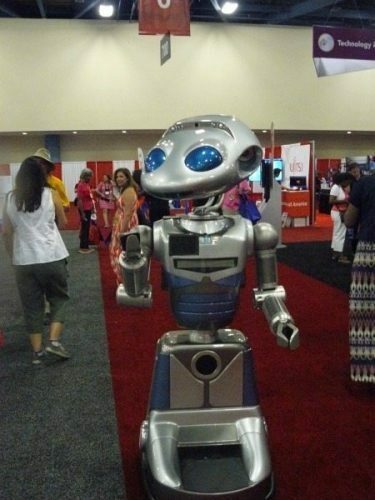 You never know whom you'll meet at the 50+ Expo. AARP is primarily an advocacy organization to look out for the interests of older people, but they also use the combined buying power of the "baby boomer" generation to get good deals for members with hundreds of companies that partner with them. AARP was founded in 1958 by Dr. Ethel Percy Andrus, a retired high school principal who espoused a philosophy of "productive aging." The organization was devoted to promoting independence, dignity, and purpose for older people, and Dr. Andrus' first purpose was to obtain health insurance for older Americans. Medicare was not enacted until 1965. Dr. Andrus was inspirted to found the organization when she found a retired teacher living in a chicken coop. Today the organization has more than 37 million members, making it one of the largest organizatons in the United States. AARP also publishes AARP The Magazine (formerly known as Modern Maturity) and AARP Bulletin, which have the highest circulation in the country. AARP has a wholly-owned taxable subsidiary known as AARP Services, Inc., which partners with other companies to offer AARP members Medicare supplemental health insurance, discounts on prescription drugs and consumer goods, entertainment and travel packages, long-term care insurance and automobile, and home and life insurance. 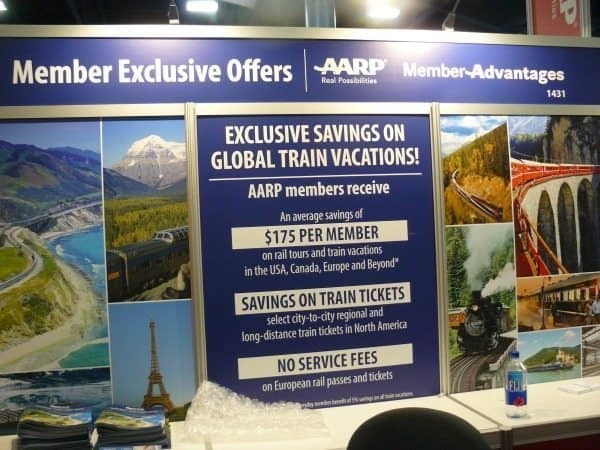 At the AARP 50+ Expo in Miami, we learned about the hundreds and hundreds of ways that a $16 annual membership in AARP can save money for travelers. Lots of hotels and restaurants and tour companies offer a ten-percent discount right off the top, but there are lots of other special offers for seniors, and even some services specially designed for older people. For example, a lot of curmudgeons like myself don't really like using cell phones; we just keep them in the car in case of emergency. 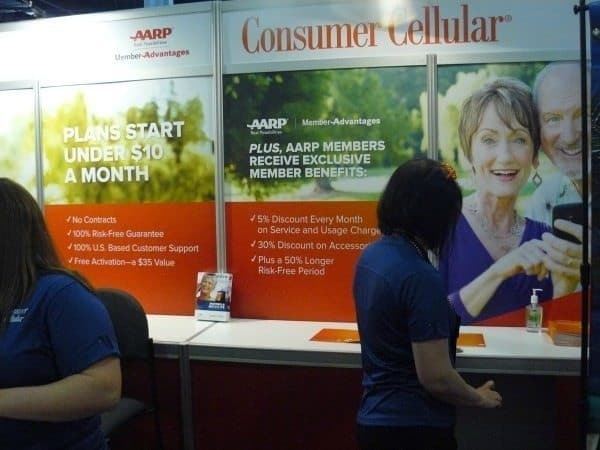 Consumer Cellular offers plans for less than $10 a month with free activation. SimpleSmartphone is a digital service specially designed for older people with lots of practical features like SOS alerts to family members and special Sim cards for traveling abroad. While AARP has car-buying programs, many older Americans might not want to own a car. Zipcar, a car-sharing network initially designed for millenials, has found that "urban boomers" (members of the baby boomer generation who have moved to the city) are a "a prime demographic for adopting new mobility solutions, such as car sharing." A study commissioned by Zipcar indicates that many urban boomers have moved to the city for a greater range of amenities, and they're just as attuned to social media and new technologies. Zipcar President Kaye Ceille says more than 15 percent of the company's members are over 50 and that number is growing. Lots of tour companies offer big savings to AARP members. Airlines, railways, tour companies, hotels, and other travel companies all know that older people are more likely to travel. For many seniors the opportunity to see the world is one of the biggest benefits of retirement. So these companies are anxious to attract customers from among the 37 million members of AARP, so they offer some serious discounts. You can make back your $16 membership fee with just one or two transactions. So be sure to check out AARP Discounts before you take your next vacation, and you might also consider taking advantage of the discounts on insurance, car rentals and phone service even if you're not leaving home. Our friends the Gypsy Nesters have lots of great content for people of, ahem, a 'certain age.' Check out their site.